The ministry of the Altar Guild is to care for the altar, vestments, vessels and altar linens of the parish. They prepare and clean the sanctuary and supervise the decoration of the sanctuary with flowers. 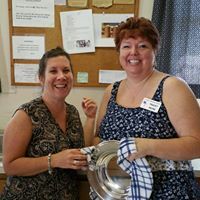 Beth Torrens & Tracey Payne, Altar Guild Members, do their ministry in August at Saint John’s.